Want to know how to strip wallpaper fast? Using a steamer is your best bet. But what’s the best wallpaper steamer for professionals as well as DIY use? I am a cleaning professional and I’ve used steamers of all types. Removing wallpaper on a large scale isn’t my kind of work. But I’ve done it before using a handheld steamer. But for this list, I collaborated with two wallpaper removal experts to recommend the top wallpaper steamers they’ve used . Let’s dive right into the reviews. In this guide, we’ve reviewed over 11 products. We selected 5 that scored highly against quality and efficiency criteria. Here’s our list of top rated wallpaper steam machines. Wallpaper removal and 6 home cleaning attachments. Long steaming sessions – 45 minutes. Over 400 customer reviews on Amazon. 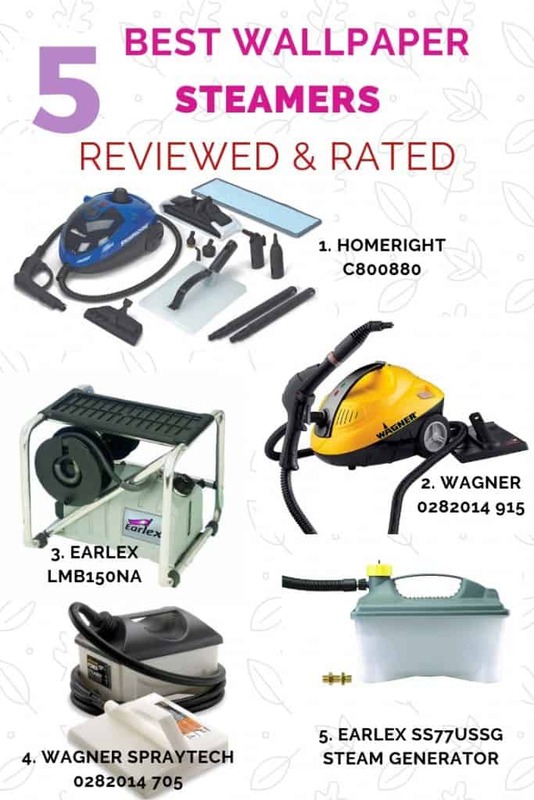 The HomeRight C800880 steamer is one of the overall best machines for professional wallpaper removal. And there are great reasons for that. The design is fairly minimal, but the machine does not lack in ability. You can use it to clean your house as well as remove old wallpaper from walls and ceilings. What I found more interesting is that the steam mop comes attached with a microfiber cloth. It does a great job wiping the floor clean after the hot steam sanitizes it. Most functional steam cleaners cost under $100, but the HomeRight C800880 Steam Machine Steamer costs slightly above that. Most likely it is because of the flat attachment that adds functionality to the steamer. You’re not likely going to use a normal household steam mop to remove wallpaper. This steam cleaner earns more points courtesy of the warranty period. You get 2 years warranty. This is a great point of confidence from the manufacturer. It actually vindicates the price point a little bit. Most user reviews are positive and rate the wallpaper remove highly. The bendy hose is a great addition for most users. Another positive point most users found is the number of accessories and attachments it comes with. 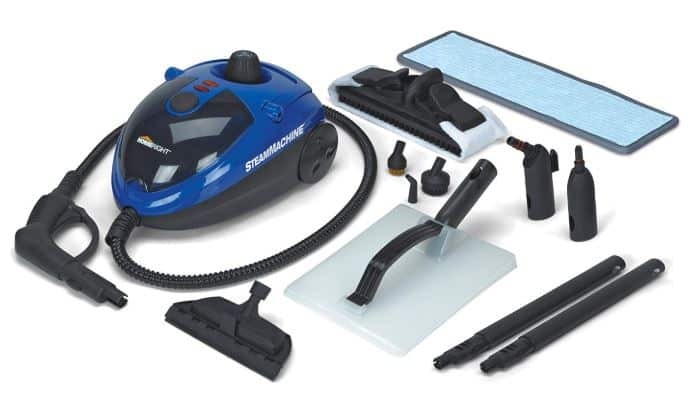 They all make it possible to use this steam machine for all-round household cleaning. Some users noted that when using the smaller attachments, the machine is noisy. This is generally due to the small nozzle working under the high pressured steam. The handle is also a little bit uncomfortable for people with small hands. Scrubbing for long can make your hand feel tired. The Earlex SS77 USSG is one of the top rated wallpaper steamer for professionals. That’s according to the professional painters and woodworkers I consulted for this review. It is a powerful tool for bending wood and removing wallpaper. If you’re working on a thick wallpaper installation, this is the right tool for you. I would also recommend if for people who want to start a wallpaper steamer rental business. It packs a powerful punch in functionality and usability. The 12-foot hose makes it easy to steam wallpaper on large surfaces. With that amount of steam over a long period, you’d imagine the hose heats up. No it doesn’t. It remains cool as one of the many safety features built into its system. With this, you get a steam box adapter, a steam pad, a 1500 watt element, and 1.3 gallon tank. That’s all you get. There aren’t any household cleaning attachments that come with this unit. 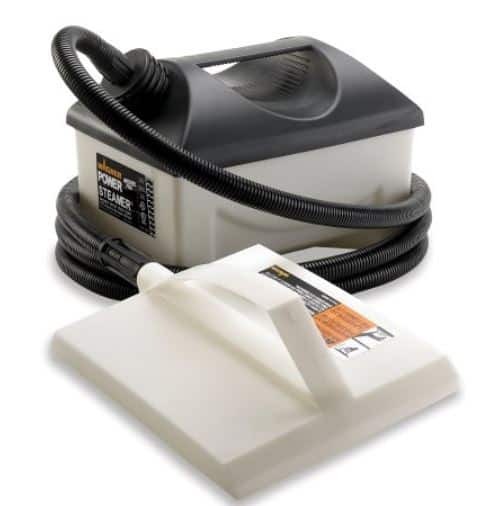 It means it is one one the best steamers for professional wallpaper removers. With the Earlex SS77USSG Steam Generator, you get a 2-year limited warranty. This is great considering the price is much lower than what most people would expect here. Over 2 hours of steaming. You can strip wallpaper on large surfaces for long. Plenty of safety features in the design. A water level indicator makes it easy to know when to refill. Very effective at steaming through heavy wallpaper installations. Takes a long time to steam up (23 minutes). A little too heavy to move around due to the tank capacity. Most users are quite satisfied with this wallpaper steamer. It is, however, important to note that most of the buyers for this one are professionals. Anyone buying this for a single use may not find it very useful because it has only two functions: stripping wallpaper and wood-bending. I only recommend this one for anyone who is in the woodworking industry. If want to do DIY wallpaper stripping in your apartment, buy a steam cleaner with a steam pad attachment. A steam cleaner with a wallpaper removal attachment. 45 minutes of steaming sessions. 8 attachments for different cleaning and steaming purposes. Most people are satisfied with what this wallpaper steam remover can do. It is durable and works effectively. Particularly, buyers seem to be impressed with the attachments and the ergonomic design. There aren’t any leaks, which makes it safe for use even with the high pressure of steam. Takes 5 minutes to heat up. The steam plate has a large surface. The hose can be extended. Powerful 1500 watt steamer is efficient. Quite pricey compared to other steamers on the market. The power cord is short. For some units, the handle heats up when using. Large 8 x 11 inch steam plate. Best for professional wallpaper removal. The Wagner Spraytech 705 is a highly-rated steaming machine ready for professionals. With it, you get 1500 watts of steam power. That’s a powerful machine for heavy duty or multi-layered wallpaper removal. The lightweight design and high power makes it possible to work on big projects with ease. You can remove vinyl and multiple layers of wallpaper even if it’s been painted over. Unlike most steamers, this particular one uses regular tap water. You do not need to distill water first. This kind of makes things cost-effective if you choose this as your best removal steamer. Peels away wallpaper with minimal scraping. Great buy for professional use. The cost is friendly for its power. Does not offer value other than removing wallpapers. One reviewer on Amazon noted that the Wagner Spraytech 705 was more effective where a clothes steamer failed. It removed 3 layers of wallpaper with ease. Another one noted that removing tough vinyl stripes was a much easier job with this tool. It is very effective and makes work easier. In general, it is effective and has 5-star ratings. It does the job it is meant to do. Has a platform to help reach higher areas. Longest hose – 16 feet. This is the second Earlex steamer on our top 5 list. It’s quite a special machine given its ability to produce powerful steam for over 2 hours. 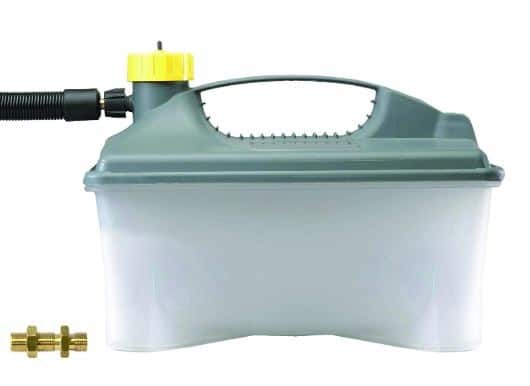 The tank capacity alone (2 gallon) will provide plenty of steam for removing wallpaper on large areas. Even though the steamer is heavy at 22 pounds, you can still push to move it around with ease. It is also well designed with in-built storage spaces for the steam plate and the rather long hose. 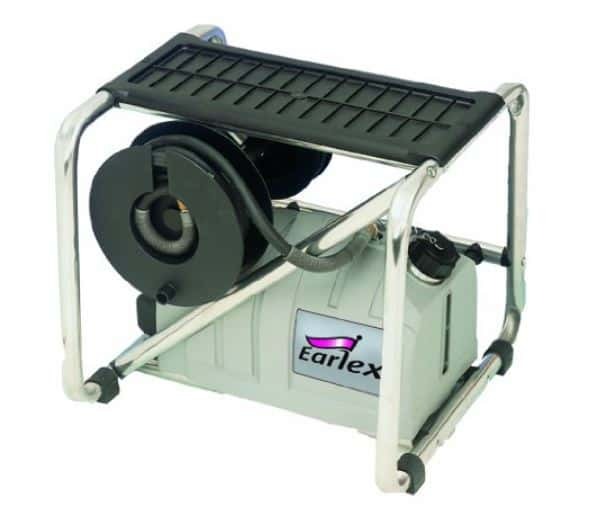 The one thing professionals love about the Earlex SteamMaster is the long cool to touch hose. You can move for quite a long distance without having to move the whole unit. Generates a lot of steam. Long hose makes it easy to steam large paper areas. Platform included to make it easy to remove wallpaper on ceilings and high windows. It takes a long time to heat the water. Quite pricey and not suitable fro DIY wallpaper removal. It is the heaviest of all the wallpaper steamers on this list. The steam pad doesn’t distrubute steam so well. Wallpaper steamers work by injecting steam into the paper. The heat from the water vapor breaks down and loosens the adhesive glue holding the paper in place. At this point, you’ll be able to scrape the paper off the wall or ceiling. If you’re trying to do this for the first time, you might want to check our guide on how to steam wallpaper off the wall here. For this task, you may need some additional tools. Heavy steaming can loosen wallpaper and make it start to peel off by itself. However, you’ll need a tool for scraping it off the wall for the best results. Or if you are dealing with a thin paper and heavy glue. Although you can use a putty knife to remove the remnants of paper and glue, a professional tool is the best.